Old Las Palmas has a rich history associated with the Hollywood era gone by, as it proudly boasts having the greatest number of celebrity homes in Palm Springs. Many of Palm Springs largest and grandest estates can be found here and served as the perfect private getaway place for the rich and famous. Some of the well known celebrities who have lived in Las Palmas include Liberace, Alan Ladd, Donna Reed, William Powell, Mary Martin, Edgar Bergen, Kirk Douglas, Elizabeth Taylor, Dinah Shore, Barbara Streisand and many others. These celebrity homes of Old Las Palmas remain as some of the most sought after Southern California real estate today. Many famous architects had their hand at designing these luxurious residences, such as William Cody, Donald Wexler, E. Stewart Williams, Paul R. Williams and A. Quincy Jones. The architectural styles range from Spanish to Colonial to Palm Springs Modern. Located in central Palm Springs, living in Old Las Palmas comes with the status of living in Palm Springs’ most prestigious neighborhood. Being within walking distance of downtown affords residents a lifestyle with many special advantages. Fine dining, boutique shopping, galleries, the Palm Springs Museum and so much more are mere blocks away…and the Palm Springs International Airport and Interstate 10 are a quick 20 minute drive away, making travel outside the desert both convenient and easily accessed. Many of the homes in Old Las Palmas have been updated with modern day amenities or restored to their original grandeur. The lot sizes vary in size from half an acre to much larger, with some estates featuring Olympic size pools, gated entries, privacy walls and lush landscaping. 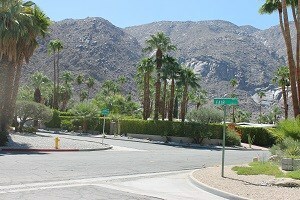 Old Las Palmas is considered to be Palm Springs’ original neighborhood. Though it does not have an official HOA, residents have the option of joining the Old Las Palmas Neighborhood Association, formed in 2005, which is committed to preserving and maintaining the beauty, security and status of this historic desert treasure. People who like Vista Las Palmas also tend to enjoy Southridge, Vistas Las Palmas, The Mesa, and Andreas Hills.